A general view shows the Western Wall (R) and the Dome of the Rock (L) in the Al-Aqsa mosque compound in the Old City of Jerusalem on December 5, 2017. 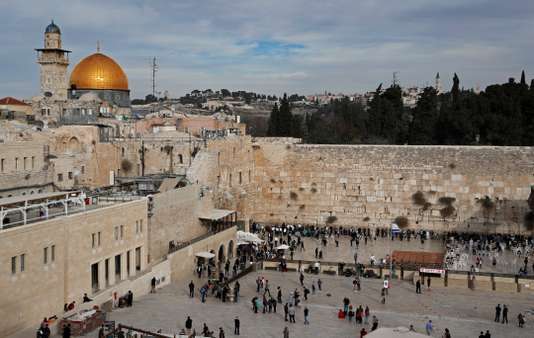 Jerusalem is poised to become the world’s leading city in tourism growth, according to a new report by leading market research firm Euromonitor. The Indian cities of Chennai and Agra took second and third place on the list, with 30.4 percent and 24.3 percent increase in growth, respectively. According to the report, tourism to other destinations in the Middle East and Africa, in particular the Tunisian cities of Jerba and Sousse and Sharm el Sheikh in Egypt, which dropped out of the top 100 cities for tourism growth, would decline. Euromonitor said this was largely due to the terrorist attacks that have hit those cities. One notable exception to this trend is Cairo, where after a decline, tourism appears to be getting back on track. On a country-by-country analysis, Japan and India are leaders in terms of tourism growth. In Japan, the cities of Osaka and Chiba have seen an average annual respective increase of 43 percent and 35 percent between 2012 and 2017, while in India, New Delhi and Mumbai both saw an average of over 20 percent in annual growth in the sector in that same period. Among European cities, the Portuguese city of Porto was expected to close 2018 with a 7 percent increase in incoming tourism. Since 2012, the city moved up 42 spots on the list to now be counted among the top 100 cities in tourism growth. The increase in tourism to Jerusalem is due to in part to a global marketing effort by the Tourism Industry. According to the data, the ministry’s decision to offer special Black Friday discounts led to a 20 percent increase in inquiries to travel agents about purchasing plane tickets to Israel. The Black Friday digital campaign received over 157 million views, over 500,000 clicks and saw some 70,000 inquiries from points of sale about purchasing a ticket to Israel. Some of the deals offered on tourism to Israel on Black Friday included flights from Germany to Eilat for 9.90 euros ($11.20). Discount flights were also on offer from Vienna and London to the southern resort city. Tourism Ministry officials expect the 4 millionth tourist to arrive in Israel in 2018 to arrive this month. Israel is also expected to see Israel break its previous record for inbound tourism in 2018. Previous articleBenjamin Netanyahu Hated George H.W. Bush’s Peace Plan. Now It’s His Policy.